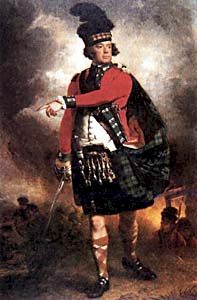 When the foundation stone of the new Eglinton Castle in Kilwinning was laid in 1797, ‘Soldier Hugh’, the 12th Earl of Eglinton, was proud to have the ceremony performed by Alexander Hamilton of Grange, grandfather of the American Hero Alexander Hamilton who was to become one of the most influential Scots in American history. 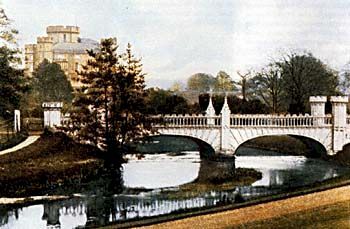 Hamilton’s family lived on the Estate of Grange which bordered on the Kilwinning lands at Stevenson, though he himself was born in the British colony of Nevis, located in the West Indies, his father being Scottish and his mother Huguenot. After serving bravely in the field as Captain of the New York Provincial Company of Artillery and as ADC to Washington, he went on to be one of the main authors of the Federalist essays - instrumental in the forming of the Constitution - he became the first US Secretary of the Treasury. Hamilton developed an impressive and effective financial plan that created immediate faith in the government of the new nation. He drafted Washington’s Farewell Address, which after editing was delivered on September 19,1796. Hamilton named his house in New York (now a National Monument) “The Grange” after his family home. 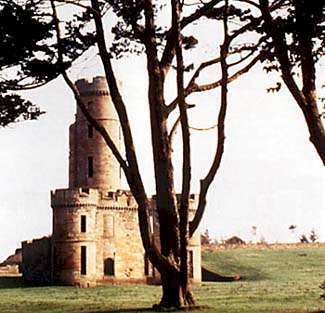 Eglinton Castle is chiefly remembered, in modern times, as the scene of the great tournament in 1839 which was a magnificent display. 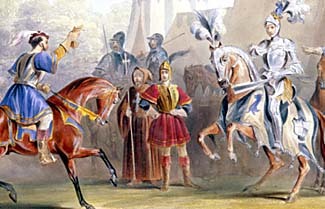 The Government had decided to scale down the pomp of Victoria's Coronation; one role abolished was that of the Queen's Champion and his ritual challenge in full armour. This role would have fallen to the Knight Marshal of the Royal Household, Sir Charles Lamb of Beaufort, the stepfather of the 13th Earl of Eglinton. were crowned, Queens of Beauty enthroned and Lamb's honour assuaged. Within 100 years, Eglinton was deserted. The Tournament perhaps marked a turning point, being a severe drain on the family fortune which, with bottomless expenditure on the Ardrossan Harbour and the Glasgow, Paisley and Ardrossan Canal, undermined a family who had been among the great families of Ayrshire. The castle fell into ruin after being unroofed in 1925 and was used for naval gunnery practice during World War II, the remains were demolished to the level they are today in 1973.